Acclaimed environmental journalist, author, and consultant Laurel Neme has traveled the globe studying wildlife and collecting stories in an effort to raise awareness about the importance of protecting endangered species. Her first book, Animal Investigators, was a “CSI for wildlife” exposing the complex web of wildlife crimes. While researching that book, she explored the world of illegal exotic pets, where she discovered that the orangutan is a prime target. The more she learned about the orangutan—their intelligence, similarities to humans, cognitive abilities, and personalities—the more she fell in love and the more compelled she felt to share their story. 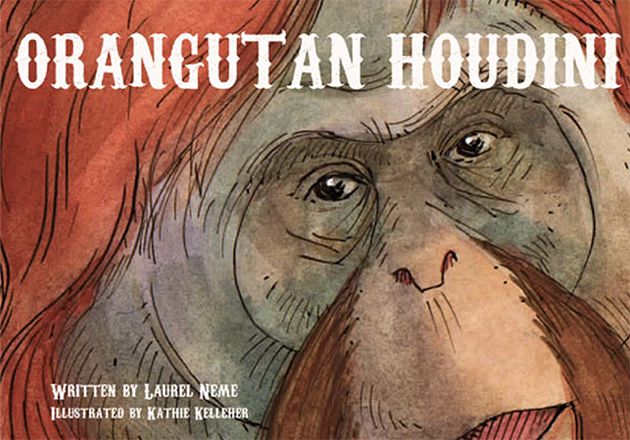 Her first children’s picture book, called ORANGUTAN HOUDINI (Bunker Hill Publishing; October 2014; $17.95; Hardcover), is a fictional tale based on a real-life orangutan named Fu Manchu who, in the 1960s, regularly outsmarted zookeepers and escaped from his enclosure at the Henry Doorly Zoo in Omaha, NE. The book features zookeeper Jerry Stones--the actual zookeeper that cared for the real-life Fu Manchu—who initially thinks Fu’s escape is the result of a careless staff member. But when he discovers Fu himself is engineering his escapes, he goes to great lengths to try and stop him—none of which prove successful. In the end, Fu reveals to Jerry how he managed to set himself (and the other orangutans) free and is awarded an honorary membership in the American Association of Locksmiths. With ORANGUTAN HOUDINI, Neme introduces children to the cleverness of orangutans through Fu Manchu’s adventures at the zoo. Fu Manchu was special to all who knew him. His escapes at zoos were never violent or aggressive, but born of the innate curiosity and ingenuity that orangutans possess. He was a beloved animal and has been the subject of many articles and books. For many years, the Henry Doorly Zoo proudly displayed Fu’s American Association of Locksmiths honorary membership as a tribute to the ape’s inventiveness. Charming, vivid, and beautifully illustrated, ORANGUTAN HOUDINI will open a new generation of readers up to the importance of protecting endangered species, encourage parents and children alike to become advocates for animal rights, and entertain readers and animal lovers of all ages. A teacher’s guide will also be made available for educational purposes in classrooms.